Two years ago we visted a number of vineyards in the Yarra Valley just out of Melbourne. One of the vineyards we went to was Tokar Estate and tonight we opened the Cabernet Sauvignon we had purchased there. This is an exceptional wine. We were both surprised just how good it was. This wine is drinking well now and to start with I thought that it didn't have sufficient tannins left in it for structure and further flavour to develop, however once it had aired we were convinced it could easily be cellared for a few more years as the tannins revealed themselves. We did have a little bit of sediment in our glasses and should probably have decanted the wine first. White pepper was the predominant smell of this dark purple wine. To taste it had a powerful dark cherry and licorice flavour and medium length. 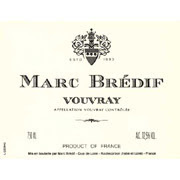 The 14.5% alcohol also added in giving this wine a good body, although it was not too alcoholic to detract from its other wonderful flavours and overall balance. We have dined at The Engine Room at Northcote Point several times (including this evening) and each time it is a great experience. The staff are friendly, professional, efficient, and nothing is a problem. They go out of their way to make your experience enjoyable. In terms of food, it is not a big menu, but Jane describes it as good honest food. Decent size portions with lots of flavour. Their wine list is equally not huge, but they have picked some great wines that are bit out of the norm. 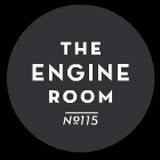 If you haven't tried it yet and want a good meal in a relaxed environment, I thoroughly recommend you add The Engine Room to your list of places try. We will definitely be back. It is a hot and sunny Summer's evening and we decided Rose was appropriate to drink this evening. We had a Brick Bay Wines Rose 2008 in the fridge from our trip to the vineyard in Matakana last year when we did the walk at the Brick Bay sculpture park (see Jane's writeup here). This is a beautiful Apricot-Pink coloured Rose which tastes more alcoholic than its 12.5%. To the nose it is a big Rose and the taste is equally big. This has a medium-long tail and is reasonably dry (although not excessively so). It took me a while to pinpoint what I was tasting, but I think the best way to describe it is that it is predominatly compromised of an alcohlic Mandarin flavour. This is great to drink on its own and is quite complex for a Rose. We would buy this again. Easy drinking. Ah bliss. 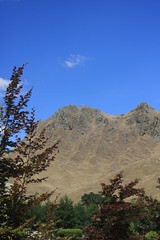 We are just home from a divine dinner at Terroir Restaurant at Craggy Range. I'm very tired at this point, so just a quick bullet point review. Roast Garlic bulb with our bread - yum! Apple tart, creme-fraiche ice-cream (wow!) and creme brulee for me with a glass of Sauternes. And the setting, oh my word, decidedly breathtaking. Thanks to Dave H for the recommendation - this is now our number one dining experience for this trip. The divinely splendid weather continues again. It is going to be very very hard to return to Auckland after all this brilliant sunshine and local hospitality. Not to mention having to return to a working 5 days a week! 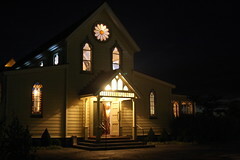 Dinner at The Old Church - this had come recommended both by a friend of Simon's and also by our Hotelier. And oh my word I am so pleased we acted on those recommendations. What a fantastic place! The church has been lavishly, even decadently furnished, with a great attention to detail. It felt quite medieval, especially drinking out of beautiful, big, slope sided glass goblets. The service was friendly and very professional, and the food quite exceptional. I had a goats cheese salad to start, while Simon had oysters 3 ways. Both were great. For mains - Roast Eye Fillet for me and Duck for Simon - again, both were lovely, and the Cauliflour Gratin side was delicioius. Dessert - 'St Mary's Sin' - a decadent chocolate ensemble for Simon and Lemon Curd Tartlet with Raspberry Semifreddo and Aloe Vera jelly for me. Again, both were wonderful. Do NOT miss this restaurant if you are in the region! Brookfields - John was so welcoming, so genuine and so passionate about his wines! And continually reaching for something from the shelves and saying, 'ooh, yes, you have to try this too, this is quite special' - and usually he was right! "Good friends deserve good wine". Thanks John! Park Estate - only 4 wines on tasting, not an especially memorable cellar door experience, however Simon appreciated tasting another Gamay Noir here. Black Barn for lunch - tasted the wines, but didn't buy. Lunch was lovely - we'd had a late breakfast and the heat was enormous so we both had the prawn and melon salad entree for our lunch - it was beautiful and perfect for the day. I then had the Lemon Tree - a trio of lemon desserts - Lemon Semifreddo, Lemon Z Jelly and lemon tartlet - all nice and zesty. 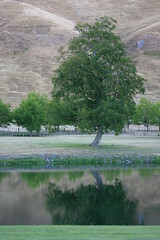 Ngatarawa Estate - met a lovely couple travelling through NZ from LA here. Cellar was kind of like a rustic barn setting which was really nice! Love their Farmgate series - not necessarily for the wine, but for the stories behind them and their great labels. Loved their lily pond too - picture for your viewing pleasure below. Finally Matariki. Trevor welcomed us in like old friends and continued in that vein. another interesting sweet wine here. 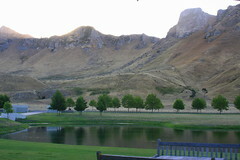 And based on recommendations from friends on Facebook, we're booked in to Craggy Range's Terroir restaurant for dinner tonight. May yet update on that once we get back. What bliss, what joy, what a wonderful way to holiday! 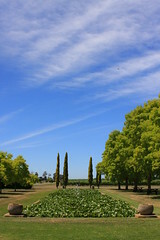 The weather in Napier is decidedly divine, the wines delicious, the countryside breathtaking. This is why I love summer. This is why I'm trying to forget that I have to go back to work next week. We've visisted so many vineyards, tasted so much wine (and a little beer & cider), seen so many beautiful hills and valleys, rivers and coastline, bought far too much wine (54 bottles and counting, oh dear), and enjoyed so much warming, cheering sunshine. How decidedly wonderful. 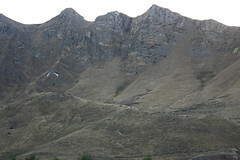 Te Mata (eep, memories where are you??? No, I'll have to wait for Simon's memory on that one. Ok, now we're both going Duh as we visit their website and remember exactly who they are - Coleraine. Duh!). Clearview Estate - where we lunched. Tim Turvey was a fantastic host and really looked after us - then we bumped into him at 2 more vineyards the next day! Dinner at Restaurant Indonesia - which came highly recommended and very much met and perhaps even exceeded our expectations. Silk Oak Chocolate shop on the way back to Napier. The Filter Room for Simon to do a beer & cider tasting and to have a beautiful antipasto platter for lunch. More photos up on my flickr pages - Napier set. Ooh - and something really unusual, every evening we enjoy listening to the sea lions barking across the road! We're almost directly across the road from Marine world. Love it! And a shout out to Cafe Ujazi - great food, fantastic friendly service. We also breakfasted at Cafe Divine which had been recommended to us, but their lack of warmth and friendliness sent us straight back to ujazi. Good food, but it's a whole experience, so we'll stick with Ujazi. Another batch done in Snowy. Finally finished the Strawberry ice cream - but I ran out of strawberries, so supplemented with cherries. Unfortunately my custard split, and I think the result is that the ice cream is a little 'fatty' with the seperated cream. I still like it, but it has a distinct texture that I think could be improved on.